Ken Loach’s new documentary The Spirit of ’45 is a romantic tribute to the achievements and ideals of the 1945 Labour government, with a clear political message. It cuts from an idealised social democratic nation celebrating the Festival of Britain (with no mention that within months Churchill would be back in power), straight to the dismantling of the welfare state, nationalised utilities and the ethos of community, first by Thatcher and then by Blair. Loach is famously no fan of New Labour, and recently called for a populist party to do for the Left what UKIP has done for the Right. 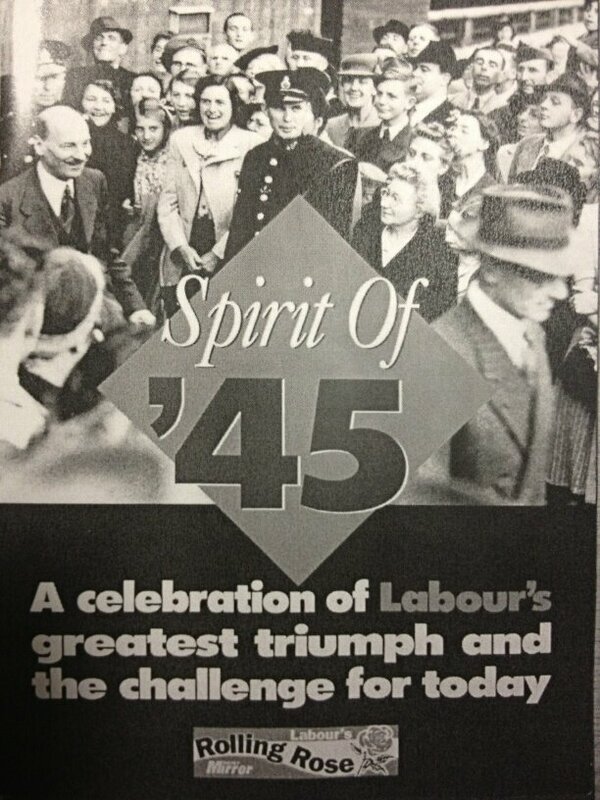 It is surprising then to note that Tony Blair produced his own tribute to the Spirit of ’45, in this case a national roadshow, marking the 50th anniversary of Attlee’s victory. The accompanying souvenir brochure (pictured) is unashamedly sepia-tinted and like Loach’s film includes features on the health service, employment, education and housing, extracts from the 1945 Manifesto and reminiscences from those who helped elect Labour. It was also similarly keen to contrast the politics of 1945, with those of the 1980s and ’90s, under columns headed ‘1995: The rich get richer and the poor get forgotten’, ‘Cash before care – and the sick are stranded in the middle’ and ‘Two million jobless pay price for enterprise culture’. Of course, the omissions are as striking as the inclusions – there is no eulogy to nationalised industry here. That this was no accident was made explicit in Blair’s speech to the Fabian Society on the fiftieth anniversary of 1945, in which he explained that socialism (or ‘social-ism’ as he put it) needed to be ‘liberated’ from the question of ownership and ‘economic dogma’. He also made clear that his narrative of British democratic socialism included ‘Lloyd George, Beveridge and Keynes and not just Attlee, Bevan or Crosland.’ Blair was not straightforwardly ahistorical or iconoclastic, as many have believed. Instead, he skilfully used different interpretations of the party’s and the country’s past, honouring and rewriting them at the same time. Nostalgia is a funny thing. It can be used to open up questions and to close them down. Steven Fielding has pointed out that the history and politics of 1945 were far more complicated than Loach allows, noting that the film might be better titled The Myth of ’45. But even myths are complicated and slippery. With its ‘One Nation’ message, Labour is again trying both to unite the country behind a shared vision for renewal, and to invoke particular memories of British history. Again, the message is open to radically different interpretations. This entry was posted in Uncategorized and tagged 1945, film, Ken Loach, myth, New Labour, nostalgia, One Nation Labour, Tony Blair. Bookmark the permalink.